What comes to mind when you hear Cuba? Is it the tempestuous history, the legendary music or the old classic cars? Perhaps it’s a bit of everything, but most probably it’s the world-famous Cuban cigars. "If I cannot smoke in heaven, then I shall not go," Mark Twain famously once said. Cuba is far from being defined only by Havana’s bustling streets and cultural sights, for the country’s scenic lands of mountain vistas and vast tobacco fields make up for a significant slice of the country’s terrain. And so, the western province of Pinar del Rio, the mecca for tobacco growing, stands out as part of a marvelously scenic Cuba. 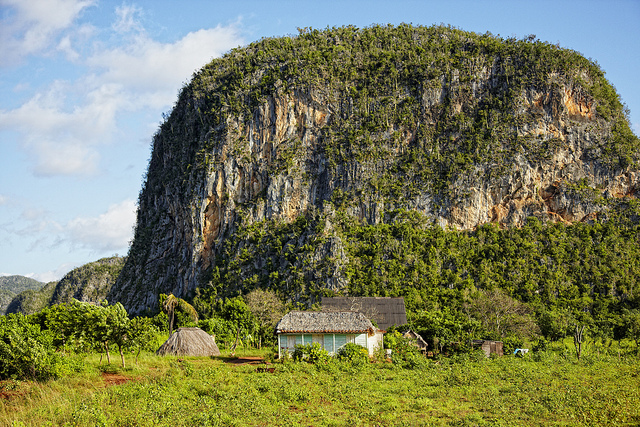 A region known for its serene pastures and incredible national park Viñales, Pinar del Río produces 70% of Cuba’s tobacco crop, used to make the world’s most revered cigars. The best tobacco, used for more expensive cigar brands, is grown in the flat lands of San Juan y Martínez. Viñales Valley is the major point of attraction here, listed as a UNESCO World Heritage Site, for its impressive karst landscape and traditional agriculture. The valley’s natural beauty is mostly used for cultivating tobacco, as well as being a popular hiking and rock climbing location. The region epitomizes the modest yet arduous life of the so-called guajiros (Cuban tobacco farmers) who carry their days farming the land. This is where the Cuban tobacco industry flourishes, fostering notoriety both locally and overseas. History-wise, cigar production in Cuba has always had its ups and downs. Several fluctuations occurred since the revolution, yet the way Cuba grows tobacco and produces cigars remains essentially the same with the exception of the nationalization of factories and some farms. The term of smoking was initially handed down from the Mayans in the term of sikar, which likely led to the Spanish word of cigarro, and then to the English word of cigar. Cuba’s fertile land and favorable climate allowed all three types of tobacco leaves to be used in a cigar - the wrapper, filler and binder - to be harvested on the island. When Columbus discovered the Americas in 1492, he also stumbled across tobacco; having colonized the region, claiming Cuba for Spain, the Spaniards ordered from the 17th century on that all tobacco for export be registered in Seville. They also forbid Cuban planters to sell the crop to anyone else, a monopoly that lasted until 1817. By the 19th century, cigars were becoming increasingly popular around the world, especially within the United States. This led many Cuban cigar-makers to migrate to Florida, where Tampa became known as "Cigar City" by the early 20th century. Why did cigars become so popular? Apart from their affordable price, Cuban cigars have always personified elegance and refinery for the sophisticated, well-groomed gentlemen, an accessory of sorts. What historical figures once set the trend for - men like King Edward VII, who, upon assuming the British throne in 1901, famously went against the smoke-free policies of his mother Queen Victoria by saying: "Gentlemen, you may smoke" - the elite upper class and cigar aficionados continue doing so today. Despite the obvious health risks made aware in recent decades, cigars remain a symbol of the erudite society, and even a fixture of pop culture. Cigars are now the subject of TV shows such as Seinfeld, and are enjoyed by countless celebrities and politicians; the message being you’re most likely happier when enjoying the scent and smoke of a good Cuban cigar. Which is why, although Americans are not currently allowed to bring Cuban cigars into the United States, who says they can’t be smoked on Cuban land? Written by Monica Suma. You can follow her on Twitter at @MonicaSuma.